Two queens can sleep up to four people. They have refrigerators, cable tv, heat and air. 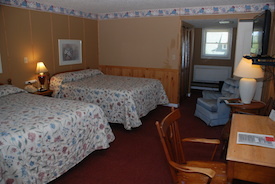 All rooms have hair dryers and wireless internet. Rocking chairs are just outside your door.